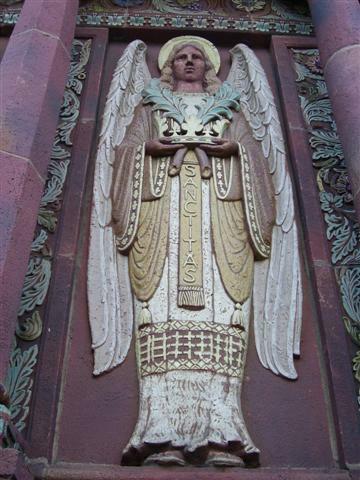 One of four angels on the church facade symbolizing the Four Marks of the Church: One, Holy [Sanctitas], Catholic, and Apostolic. Thank You, Bill and Gwen! ~ On Sunday, June 12, the parish honored Warren at a special reception following the 10 AM Mass. 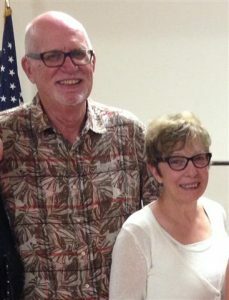 Bill, a recent retiree and former owner of Hertel Parker Liquor, first became associated with our parish in the Fall of 1998 when he hosted our first wine tasting. He and Gwen subsequently became both parishioners and benefactors. Over the next sixteen years, their generosity allowed us to raise thousands of dollars for our parish and two community organizations we supported, the Interfaith Hospitality Network (now Family Promise) and The Bridge. Special thanks to Bob Heicklen and Jessie Wells for hosting such a wonderful luncheon for all of us. The Parish Council will meet on Wednesday, June 15, at 7 PM in St. Charles Hall. This is the last regularly scheduled meeting until September. Please make every effort to attend so that we can finalize plans for summer events and coordinate committee follow-up. Congratulations are in order for Esquisite Dunnigan, a member of Tapestry Charter School’s track and field team. Esquisite and her teammates placed first in the 4×100 relay in the Division II competition at the New York State Public High Schools Athletic Association championship meet held at Cicero-North Syracuse High School on June 10. 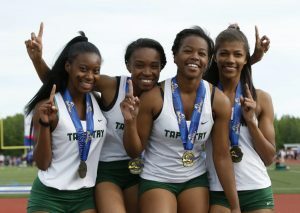 They ran the relay in 49.3 to claim Tapestry’s second straight title in that event. Compassion Ministry training ~ If you are interested in visiting those in the hospital, nursing homes or the homebound, either in person or by phone, training for this “compassion ministry” will be offered again this summer beginning on July 25 at 6:30 PM and continuing for five additional Mondays. To find out more or to sign-up, please call Sr. Maureen Harris (716-882-3129), Joyce Menefee (716-832-7728), or Pat Dyer (716-308-6302). Catholic Communication Campaign ~ Your contributions to the CCC collection continue the work of communicating the Gospel around the world. In addition, 50% of CCC funds collected in our diocese remain in the diocese to support local communication efforts. Thank You for your generosity. Care for Creation ~ June 18 is the one year anniversary of Pope Francis’ encyclical, Laudato Si, Care for Our Common Home. “The urgent challenge to protect our common home includes a concern to bring the whole human family together to seek a sustainable and integral development, for we know that things can change. The Creator does not abandon us; he never forsakes his loving plan or repents of having created us. Humanity still has the ability to work together in building our common home. I urgently appeal, then, for a new dialogue about how we are shaping the future of our planet. We need a conversation which includes everyone, since the environmental challenge we are undergoing, and its human roots, concern and affect us all.” (13 and 14) www.usccb.org/issues-and-action/human-life-and-dignity/environment/index.cfm. 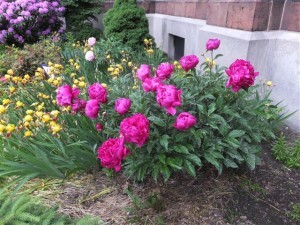 Our Sacred Sites Open House ~ A thousand THANKS to all the wonderful volunteers who helped with BT’s Sacred Sites Open House on the weekend of May 21-22. We hosted more than sixty people, and every single visitor was positively impressed by the church – and by the kindness, knowledge, helpfulness and enthusiasm of all the volunteers. We heard nothing but good things from everyone who came! And we also learned some new facts and heard some interesting stories from folks who’ve been part of the parish’s history over the years. Everybody had a good time – with a big THANK YOU to all of you. To view photos from the Sacred Sites Open House, click HERE. New rectory office hours ~ Please remember that since May, we have new rectory office hours: Tuesday-Thursday from 10:30 AM – 2:30 PM. Please call our secretary, Barbara Sercu, at 716-833-0301 if you have changes to your phone number or mailing address. Gun Violence and Mental Health ~ On Wednesday, June 15 at 7 PM in the St. Joseph University Parish Community Room, Michael Ranney, Erie County Commissioner of Mental Health, and Dr. Jeffery Grace, psychiatrist will address this topic. The presentation is free and open to the public. It is being sponsored by the St. Joseph Committee Against Gun Violence and New Yorkers Against Gun Violence. The Soul of Compassion will be presented on Monday, June 20 at 4 PM at St. Aloysius Gonzaga Church, 157 Cleveland Drive, Cheektowaga. During times of grief, the need for understanding yourself and others and acting with compassion is imperative. Realizing that everyone has a deep, shared desire for goodness and that nobody wants to suffer, allows you to respond to life’s challenges with greater wisdom and kindness. Presenter, Jesse Wicher, is the founder of Holistic Arts Buffalo. This program is part of the bereavement lecture series at the Catholic Diocesan Cemeteries. There is no charge to attend. For more information or to reserve your spot, call 873-6500. Catholic Charities Benefit Concert ~ Do you have your tickets yet for a great evening of song? The Forte Tenors concert at Kleinhans Music Hall in Buffalo to benefit Catholic Charities is Thursday, June 30. It’s a terrific Father’s Day gift idea, too. Presented by LP Ciminelli and an anonymous donor, all proceeds will benefit the programs and services of Catholic Charities. Forte has quickly established itself as the hottest new crossover sensation and the most successful group to be launched from the reality series America’s Got Talent. There is even a special meet and greet VIP ticket opportunity. Find out more and purchase tickets at www.kleinhansbuffalo.org.